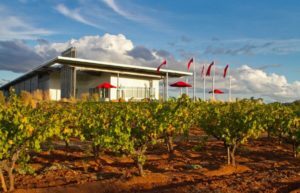 This selection of wine tour destinations is hand picked for their high end elegance, wonderful facilities and exceptional tasting room experiences. Opened in November of 2010, Andis Wines brings a modern and fresh approach to Amador County’s winemaking region. Our focus: seeking out the best vineyards in the Sierra Foothills to craft wines with balance, character, complexity and varietal correctness. Using both traditional and innovative winemaking approaches, Andis Wines have quickly garnered 90+ point scores in Wine Spectator and Wine Enthusiast, glowing reviews in print and online media, and placements in some of the finest restaurants. Our building is a state of the art winemaking facility built with a “green” design. The spacious tasting room offers panoramic vineyard views of surrounding Amador wine country, expansive picnic areas, a bocce ball court, daily winery tours, and wine on tap! Our gracious staff awaits; make Andis Wines a must-stop on your Amador wine tasting adventure. Situated in the picturesque Amador County, Renwood is surrounded by the rolling hills and rushing streams of California’s gold country. Renwood was established in 1993 and is today one of the most respected wine producers in the Sierra Foothills. With historic old vine Zinfandels, complex Syrahs, sensational Barberas, and much more, you will find that Renwood wines express a true sense of place. Our goal is to create world-class wines that are approachable, delicious and appealing to the senses, while representing the soils in which they grew. We strive to create wines and experiences that guests can’t help but to fall in love with. That is our highest priority! Beautiful award-winning Tuscan-style gardens provide the ideal setting to savor a glass of fine Villa Toscano wine and share a meal with family and friends. Our winemakers, George Bursick and Susan Farrington have added their extensive experience and discerning palates to create wines of intensity with elegance. From the Tuscan-style gardens to the elegant tasting room and gift shop this Shenandoah Valley gem is not to be missed! With over 30 years experience in grape growing, the Borjòn Family knows a thing or two about producing premium wine grapes. The tasting room at Borjòn is incredible! Don’t miss this elegant destination.